Stamageddon breezed in and out of Toronto this week. We all managed to survive it. In all likelihood, not much. As in, literally not much at all. 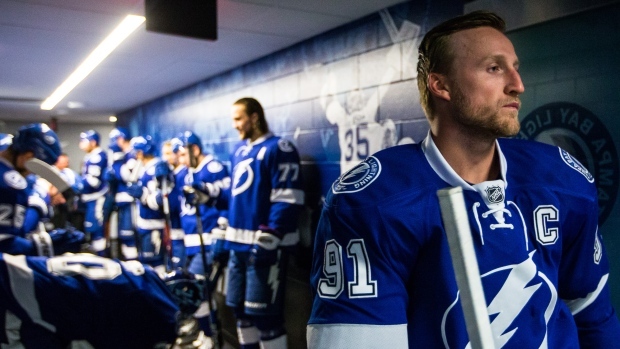 Steven Stamkos won't be playing for the Tampa Bay Lightning next season. But c'mon, if Stamkos and the Bolts were going to live happily ever after they'd be at least a little cozied up by now, sort of like where it currently stands with Anze Kopitar and the Los Angeles Kings. Stamkos and the Lightning aren't even holding hands. ‎Absent a lightning bolt out of the blue, they're not going to either. What's interesting for me now is how they will go about going their separate ways. In the short term, their respective self-interests are somewhat aligned. Stamkos needs to play better. He was mostly invisible in Tampa's 5-4 overtime win in Toronto. He has only two goals in his last 14 games and none in his last 10. The 25-year-old doesn't look like himself at all. He's basically auditioning for July 1.‎ The better he plays, the more he increases his value and the number of teams interested in signing him. As for the Lightning, coach Jon Cooper noted after the Toronto game they are 8-4 in their last 12 games without any measurable goal contribution from the captain‎. He said it a little nicer than that, but point taken. To say nothing of the fact the Lightning has also been decimated with injuries lately. They're just barely below the playoff line in the Eastern Conference, so imagine where they might get to if Stamkos starts scoring like he can and they get healthy. 3. ‎Don't trade Stamkos and play it out; go as far and as deep as they can with him in their lineup and then bid him adieu in the off-season, taking his current $7.5 million in cap space, or the $9 to $11 million they might've paid him, and spend it elsewhere next season. Stamkos has full no-movement and no-trade clauses. He isn't going anywhere before the trade deadline unless he wants to engineer his own departure. It seems doubtful he would go down that road, but no sense speculating. It's too early. The only advantage to the sign-and-trade for Stamkos is that he can get an eight-year deal from Tampa, a seven-year deal from anyone else on July 1. Does that even matter to him? Beyond that, is there any advantage to picking a new home by Feb. 29 instead of July 1? And, realistically, what team is going to give up significant players and/or draft pick assets to Tampa before Feb. 29 when it could just sign him on July 1 with an acquisition price of gratis? Nevertheless, it will still be fascinating to see if Tampa approaches Stamkos on either of the rental trade or sign-and-trade scenarios. The presumption is Tampa is more likely to play out the rest of the season with Stamkos in the lineup. Again, though, it’s probably too soon to say. So, for now, it should be a whole lot of status quo (nothing), outside of the ongoing speculation of not only what both parties will do prior to Feb. 29, but what Stamkos may do come July 1. Leaf fans, and perhaps the team's hierarchy, get giddy at the prospect of a local boy and star of that stature ‎possibly coming home. But this whole Stamkos-to-Toronto-as-a-foregone-conclusion‎ thing has gotten way out of hand. If Stamkos goes to free agency, the NHL is his oyster. I said on radio yesterday he would be a great fit in Montreal or Nashville, only to illustrate the point is he'll have many options. Not every team is able to take him, logistically or financially, but there'll no shortage of choice. McKenzie: Who's to say the Habs won't go for Stamkos? TSN Hockey Insider Bob McKenzie joins TSN Drive with Dave Naylor and Dave Feschuk talk about Steven Stamkos' future in Tampa Bay and which teams would be in on Stamkos should he hit free agency. There has been all sorts of speculation Stamkos will be looking for mega-millions, potentially more than Jonathan Toews and Patrick Kane at $10.5 million AAV. I don't necessarily buy that money will be the primary motivation here. I never say "it's not about the money" because, in some form or another, it often is. And I don't doubt his agent Don Meehan will ask for the sun, moon and stars. Who wouldn't with a 26-year-old free agent with those skills? - Intangible value. How he feels about the coach and how the coach feels about him? What position is he playing - centre or right wing?‎ Role? Minutes? Does he get that warm and fuzzy feeling? - Tangible value. How much money? - Contending status. Right there?‎ On the way up? No shot? - Traditional hockey market. If he leaves a non-traditional locale (Tampa), would he prefer a more traditional market? Original Six? Canadian? - Proximity to family and friends.‎ Drop a pin on Toronto and work your way out from there. Doing the free-agent dance‎ in the summer gives Stamkos the most options and allows him to use a sliding scale of the above factors to weigh his decision. Teams that otherwise couldn't afford him or not make it fit in-season could get into the game at the draft or July 1. Buffalo? The Sabres expressed interest before last summer's draft and it's a rebuilding franchise with a desire to make bold moves. Detroit? Pav and Z aren't getting any younger. Wings' GM Kenny Holland could harken back to the good, old (pre-salary cap) days and find the money to go UFA shopping. Edmonton? Not sure how the Oilers could shoe-horn Stamkos money into McDavid/Hall/Draisaitl et al money, to say nothing of what they would do with Ryan Nugent-Hopkins or others, but dare to dream of the possibilities. Montreal? Sure, why not. Price, Subban, Stamkos, nice trio to build around. Cap complications? Probably, but Stamkos would address a need. Nashville? Not a traditional hockey market, maybe not as close to contending status as one might like but a No. 1 offensive centre‎ may go a long way towards remedying that. New York Rangers? The Blueshirts have some financial shackles, but for the right player at the right price, moves could be made. St. Louis? I can think of a lot of reasons why it couldn't happen but I can think of one - trying to beat Chicago - that it could. Toronto? Did you know this is where Stamkos grew up? We could play this game all day. I guess, in interests of accuracy, because no doors have been slammed shut just yet, we have to also include Tampa as a possibility. I hear taxes are very low there. In the meantime, we wait and we wonder. When is the next Leafs-Lightning game in Toronto anyway? Feb. 29. Trade Deadline Day. Bob McKenzie is the 2015 recipient of the Elmer Ferguson Memorial Award for excellence in hockey writing.